If you like white wine and want to change things up this fall try the Turbiana grape. 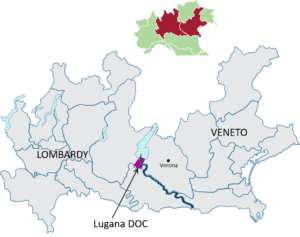 It’s from the inter-regional DOC Lugana shared between the Italian Lombardy and Veneto regions producing mostly rich, fuller-bodied wines. While in southern Lake Garda last year I spotted Lugana at a wine shop. Then visiting Pratello winery they poured their Lugana- my first taste of Turbiana, also known as Trebbiano di Lugana. In the Veneto region it’s known as Trebbiano di Soave. It was as Susannah from Avinare shared “Liquid Gold” and she was right. 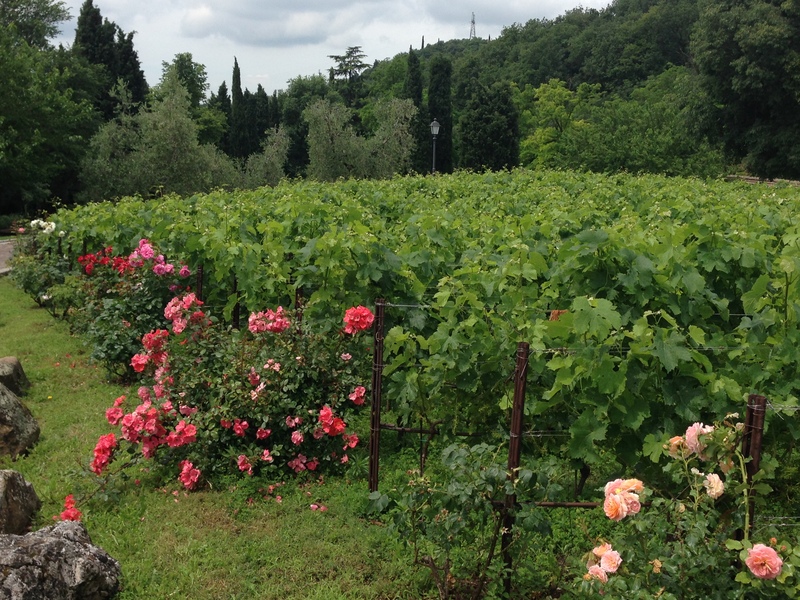 Our Italian Food, Wine and Travel Group highlights Lugana this month. If interested in learning about the region, primary grape, foods to pair with this wine and I suspect travel tips too join us on a Twitter Chat Saturday, October 6th (8am PT / 11am ET / 5pm in Italy) using the following hashtags: #ItalianFWT #VinoLuganaDOC #LakeGarda. There are several info-packed articles from the group too. You can scroll down to access links. Regulations call for a minimum of 90% Turbiana, but most producers stick with 100% these days because the grape doesn’t need any help expressing itself. Literature says Turbiana has an affinity for oak and ages well. The Superiore level requires 12-months before release and Riserva 24 with 6-months in bottle. Turbiana intrigues me. Although considered a biotype of Verdicchio grown in the Marché region it’s like a chameleon- depending on where it grows, it adapts to and produces distinctly different wines. It did this in the southern end of Lake Garda where the Lugana DOC lies in Lombardy, finding its way there in the centuries ago. And it did the same on the Veneto side where the grape is called Trebbiano di Soave. This brings up the controversial terroir discussion and whether an area- topography and soils, meso-climate, flora, and culture- can affect a wine. I’ll leave that for another discussion! But I can confidently say Turbiana from Lugana I’ve tasted is different from Verdicchio in the Marche. Like Verdicchio the acid is higher but Lugana tends to have less citrus and more tropical fruit, more spices and a richer, fuller body. The southern end of Lake Garda is blessed with a Mediterranean climate thanks to Italy’s largest lake that was formed by glaciers: mild winters with warm to hot summer days and breezes off the lake. Turbiana thrives in this environment on calcareous clay soils. I thrive in that climate too, it’s a great place to visit and fits into Mark and my theme when it comes to travel: Food, wine and hiking. 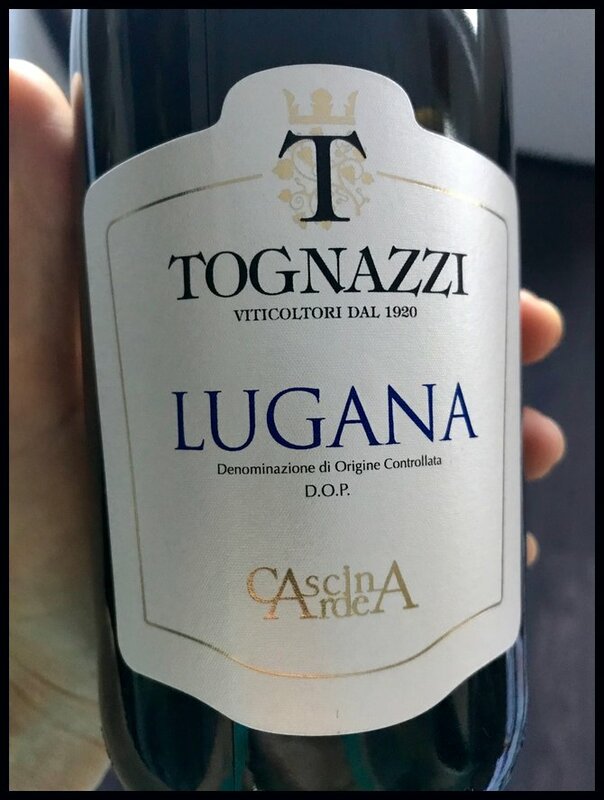 Mark and I tasted our way through several Lugana wines that trip, brought some home and ordered more. We have yet to taste Lugana riserva, late harvest or spumante so we better get busy! Basic Lugana accounts for 90% of production from a plethora of producers with their own styles and winemaking practices. These wines are meant for enjoying upon release whereas riserva and late harvest age well, the former spending time in barrels. Tognazzi winemakers since the 1920s, the family purchased Turbiana vineyards in the heart of the Lugana DOC in 1996. This particular wine doesn’t see any wood, just 100% stainless steel. Taste Profile: baked yellow apple, less ripe yellow plum, pineapple and lemon zest aromas; initial bright citrus palate with a brush of non-sweet mixed stone fruit coulis; high acidity and medium body. We enjoyed this with a casual and easy to make avocado toast with a fried egg for dinner. And Fig Crostini (taking advantage of figs in season!). The organic Pratello Catulliano Lugano DOC shined with a salmon bowl. And I imagine Turbiana superior or riserva with a dressed up crab cake would be super together. What do you think?!? Thank you Italian Wine Central for use of your Lugana DOC map! And Italian Wine Unplugged Grape by Grape for writing a fantastic book about wine grapes. Now that I’ve read your post I’m imagining a side-by-side tasting with Verdicchio from Le Marche and Turbiana. Both of the wines you describe sound delicious and I wish I had a glass right now, with a few of those fig crostini. Cheers Lynn! Yes to the figs! And how fun would it be to throw in a third- Trebbiano di Soave (Veneto)?!? I love the casual deliciousness of your pairings. I would never have thought to serve wine with the avocado/egg toasts…I can’t wait to try it. Very informative Lynn! And insightful — it helps to have spent time the ground! Thank you! And yes it would be fun to taste these wines side by side — with similar vintages and oak treatments! Thanks Gwen, perhaps we’ll have to do a future tasting! I was lucky enough to try a Lugana Riserva 2015 – all stainless steel, no oak. Still with nice acidity, medium bodied but also notes of honey. It was delicious! Our Lugana guides told us the wine actually gets better in the bottle. Tried a late harvest Lugana, and an orange wine from Lugana, only one producer of the orange wine. I too am eager to try more wines from Lugana! Thanks for sharing that Jane. I’ll see if I can order it here to try! Trying to stay healthy and building up an appetite!